The language of peace, communicating to create harmony, edited by Rebecca L. Oxford. 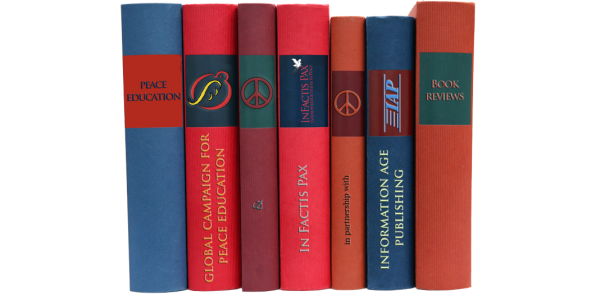 Building a peaceful society: creative integration of peace education, by Laura L. Finley. Peace education from the grassroots, edited by Ian M. Harris. Universidad de Puerto Rico / University of Puerto Rico. Special Issue Editors: Anita Yudkin, Anaida Pascual Morán, Liliana Cotto Morales, and Fuad Al-Daraweesh. Candice C. Carter (ed.) Conflict Resolution and Peace Education Transformations across Disciplines, New York: Palgrave Macmillan, 2010. ISBN: 978-0-230-62063-6. 237pp. A review of Laura A. Dickinson, Outsourcing War and Peace: Preserving Public Values in a World of Privatized Foreign Affairs. (New Haven and London: Yale University Press, 2011). Fostering Social, Emotional, Ethical, Civic and Academic Learning (SEECAL) Through Constructive Controversy: What are the Implications for the Professional Development of High School Teachers? by Diane R.Wood, Elizabeth K. DeMulder, and Stacia M. Stribling. Lori Olafson: “Good” Americans and “Bad” Americans: Personal Epistemology, Moral Reasoning, and Citizenship. Claudia Ruitenberg: Conflict, Affect and the Political: On Disagreement as Democratic Capacity. Michael Weinstock: Epistemic Understanding and Sound Reasoning Skills that Underlie Effective Democratic Engagement. Gregory Schraw, Lori Olafson, Michelle Vander Veldt, & Jennifer Ponder: Teachers’ Epistemological Stances and Citizenship Education. Lisa Bendixen(Discussant): Argumentation, Anger, and Action: Citizenship Education In and Out of the Classroom. Dale Snauwaert (Discussant): Democracy as Public Deliberation and the Psychology of Epistemological World Views and Moral Reasoning: A Philosophical Reflection. Broadening Horizons: Is There a Place for Peace Education in the American Legal System and More Specifically in Family Law? Peace Channel: A channel for human rights education and peace in Nagaland. Reclaiming a Democratic Political Community: A Review of Paul Theobald, Education Now: How Rethinking America’s Past Can Change Its Future (Boulder: Paradigm Publishers, 2009). The Earth Charter, a Radical Document: A Pedagogical Response. Special Issue: What is the Relationship Between Knowledge and Peace?